The various commodities moving through the Tampa Bay region are carried by a variety of transportation modes, including trucks, sea vessels, freight trains, cargo planes, and pipelines or some combination of these modes. The vast majority of domestic freight in the Tampa Bay region – over 263 million tons in 2012, or about 84 percent of the total – is moved by the truck mode alone, and trucks are expected to absorb most of the growth in freight traffic in the future. One of the major reasons for the dominance of truck shipping is that while in many regions fuel is distributed by pipeline, in the Tampa Bay region it is distributed from seaport terminals within the region and in other parts of the state by truck. While Port Tampa Bay, is connected by pipeline to Tampa International Airport, MacDill Air Force Base, and Orlando International Airport, the pipelines are used primarily for the shipment of aviation fuels. 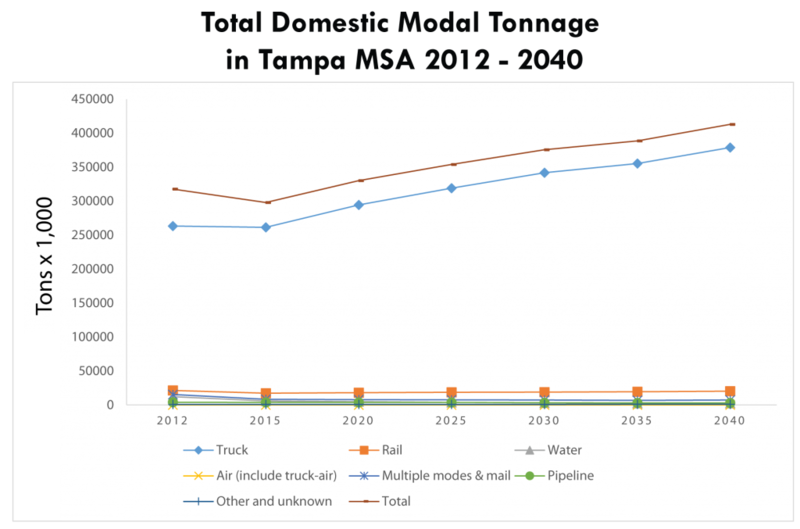 Thus, in the region, fuel for motor vehicles is almost exclusively delivered by truck. Other key commodities carried primarily by trucks include gravel and nonmetal mineral products (building materials), waste/scrap (metals), other agricultural products (produce), fertilizers (phosphate derived), and other foodstuffs. The rail mode is the other major overland carrier of goods. In 2012, railroads carried more than 21 million tons of freight (not including multimodal cargoes). The primary commodity moved by rail is fertilizer. Other major commodities served by rail include nonmetallic minerals, coal, and basic chemicals. Many commodities are moved by a combination of modes, usually truck and rail. In 2012, at total of 15 million tons were moved into, out of, or around the Tampa MSA by multiple modes. Major multimodal commodities include fertilizers, gasoline, nonmetallic minerals, coal, and animal feed.